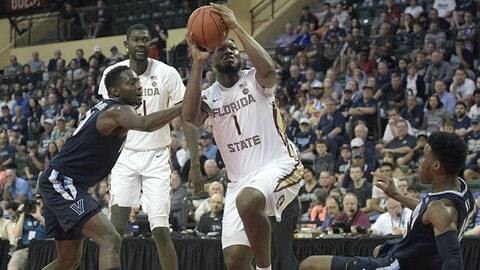 The FSU Seminoles were handed their first loss of the season Sunday against Villanova in the championship game of the Advocare Invitational. Third in last week’s poll , Gonzaga leapfrogged No. 2 Kansas to the top spot in The Associated Press Top 25 released Monday. The Zags received 32 first-place votes from a 65-person media panel, edging the Jayhawks by one. Ohio State had the biggest jump in this week’s poll, moving up seven spots to No. 16 after rolling over Samford and Cleveland State. Iowa climbed six spots to No. 14 and Purdue was up five to No. 19. Texas went from out of the poll all the way up to No. 17 after beating the Tar Heels and playing No. 9 Michigan State close in the tournament’s second title game. Texas Tech is in the AP Top 25 for the first time this season at No. 20 and Maryland came in at No. 24.